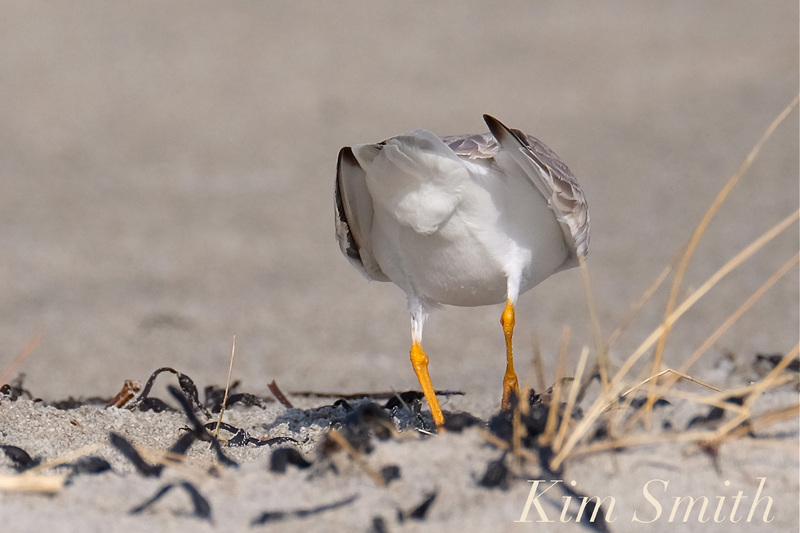 Thank you to all the friends of our Good Harbor Beach Piping Plovers, to dog owners who are staying away from Good Harbor Beach, and to all who are advocating for the PiPl. Early this morning I found both Mama and Papa feeding in the intertidal zone, along with the “Bachelor.” The second pair has not been seen since they were chased off the beach last weekend. There seemed to be fewer dogs on the beach this morning and I am so grateful to the dog owners who are helping to watch over the Plovers. Yesterday was a much needed quiet day for the Plovers; it was cold and rainy, and an on-leash day. There were folks with dogs off-leash, though they weren’t near the PiPl. But there were fresh tracks running through the nesting area. Here is why, at this very critical time during Piping Plover breeding, it is imperative to keep dogs and people out of the nesting area. The Plovers are actively courting. What does that mean exactly? The Plovers first stake out a territory. For the third year in a row, they have chosen the area around the big rock, by boardwalk #3. Both male and female vigorously defend the territory from other Piping Plovers, as well as other species of large and small birds. Throughout an average quiet day, the male PiPl builds many “nest” scrapes for the female to inspect. If the female is interested, the male displays an involved courtship dance. If she continues to be interested, he will mate with her by jumping on her back where they join together cloaca to cloaca, but for only mere seconds. During that time the male fertilizes the female’s egg. Piping Plover courtship requires a tremendous amount of energy, and each courtship episode takes about twenty minutes, from nest scrapings to mating. If the birds are constantly interrupted by dogs tearing through, and people walking through, the nesting area, courtship and mating are delayed, over and over again. 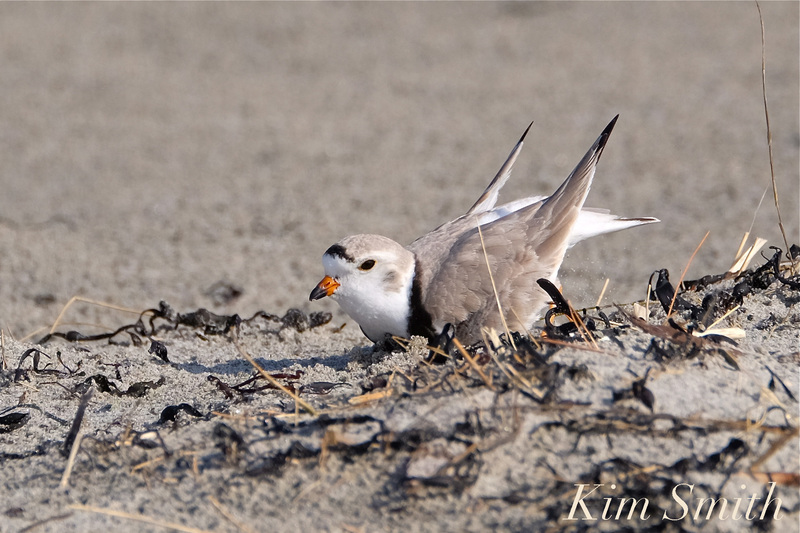 If the Piping Plovers are allowed to mate early in the season, the chicks will be born that much earlier. The earlier the chicks hatch the greater their chance of survival, especially in the case of Good Harbor Beach, Gloucester’s most beloved and heavily trafficked beach. In addition to repeated courtship interruptions, we are having an unseasonably cold April. The Piping Plovers are spending a great deal of energy just trying to keep warm. This is evidenced by how often they stand on one leg to thermoregulate. Papa Plover defending all things Mama Plover. Papa Plover energetically building shallow teacup-sized nest scrapes. Papa Plover inviting Mama Plover to inspect. Male Plover cloaca. All birds have a cloaca, the V-shaped vent from where sperm, eggs, and pooh are emitted. During courtship, the male’s cloaca swells considerably. Meet “the Bachelor,” the bird bane of Papa’s existence. 1) Under no circumstances is it acceptable to enter the Piping Plover nesting area. 2) Keep ALL dogs far away from the nesting areas. 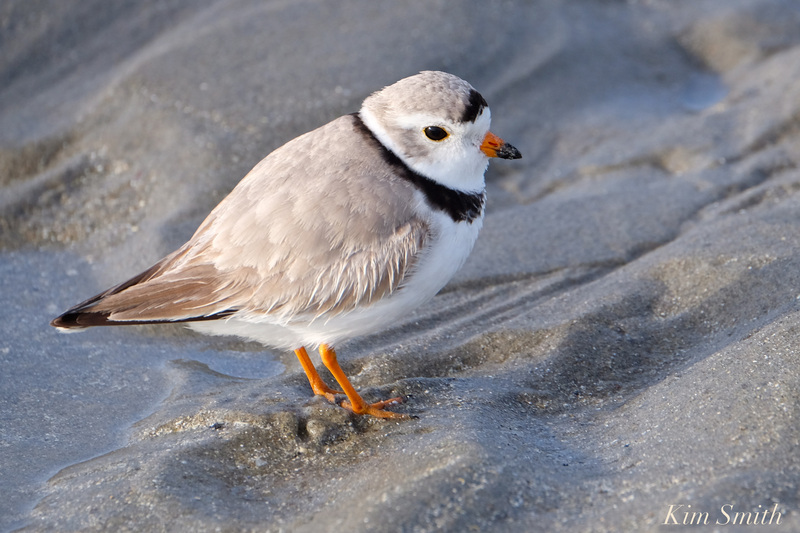 A Piping Plover’s brain does not differentiate between a dog on- leash versus a dog off-leash. When a dog, off-leash or on-leash, comes within twenty feet of a PiPl, they immediately stop what they are doing, whether foraging, courting, mating, or resting. 3) During courtship, the Piping Plovers tolerate one or two quiet persons, from a distance, but crowds of three or more put them in panic mode. 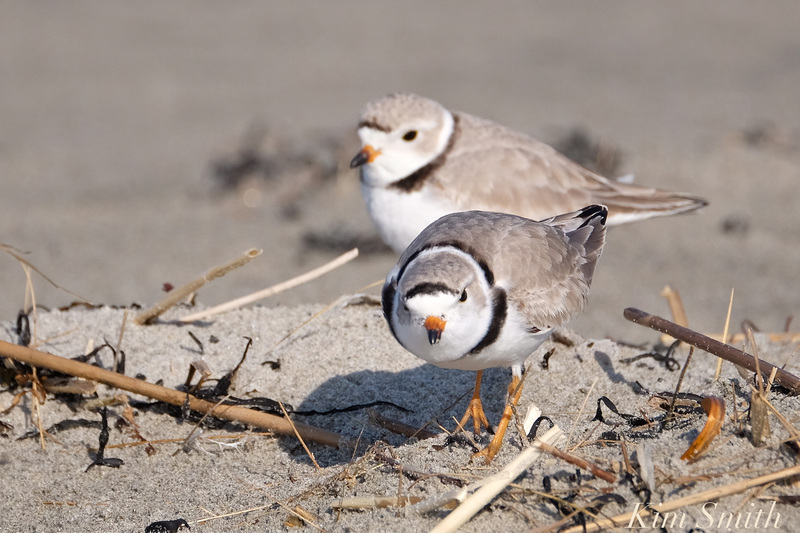 4) Help spread the word about the Good Harbor Beach Piping Plovers. Thank you, but most importantly, the Piping Plovers will thank you too when chicks hatch and chicks fledge! Found Mama and Papa PiPl foraging in the tide flats, with two northward migrating Sanderlings. Papa tolerated the travelers, until they got too close to Mama, when he then chased them ten feet back. It was cold and windy, low tide too. Most dogs were in the intertidal zone, not near the nesting area, although tons of fresh dog and human footprints in the roped off area from earlier in the day. So hope the other three that were chased away have found a new location or will return possibly. 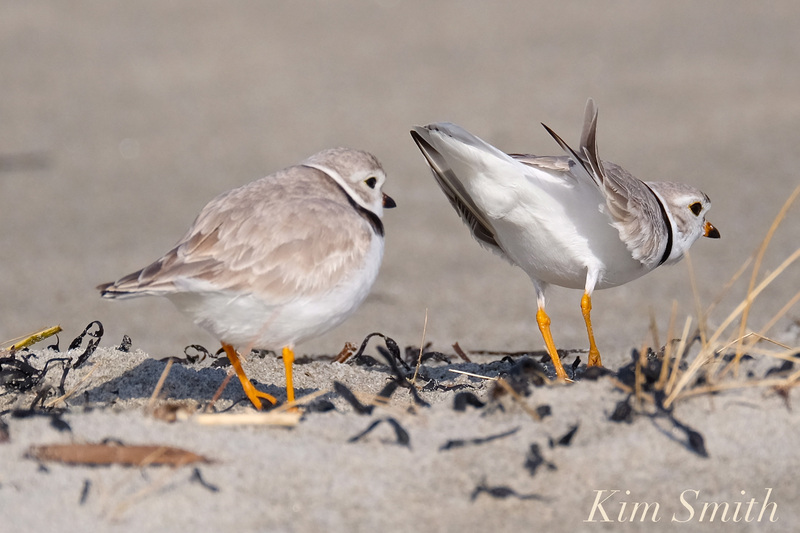 This entry was posted in Birds, Birds of New England, Good Harbor Beach, Life at the Edge of the Sea, Piping Plover and tagged Charadrius melodus, Good Harbor Beach, how you can help piping plovers, observing Piping Plovers, Piping Plover, piping Plover courtship, Piping Plover Female, Piping Plover male, Piping Plover nest, tips for piping plovers on April 21, 2018 by Kim Smith.